I like that Barcelona's players continue to back Philippe Coutinho. And support him. Like they did with Ousmane Dembele. At the end of the day, the strength of a team is in the unity of the dressing room. But Coutinho's problem is not solved with pats on the back. It's much deeper. It has to be attacked at the roots. 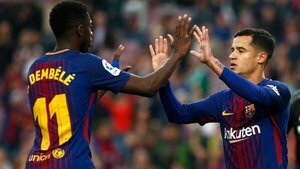 Valverde defends Coutinho against the press, insisting that the Brazilian tries everything... but nothing comes off. His teammates defend him because he's a good guy who doesn't get involved in controversy. But the reality is different and one year after his debut as a Barça player we have still not see 10 percent of the Liverpool Coutinho that seduced us so much. And the moment has arrived to make a decision. And there are only four options: 1) Keep giving him confidence and see if he can be 'resuscitated'. 2) Sit him on the bench and bring back Dembele. 3) Look for a new position for him, which is almost impossible. 4) Prepare to sell him in the summer and get as much of the investment back as possible. We will see what's chosen on Sunday, at San Mames against Athletic. It will be the first clue as to what the future holds for Coutinho.